It’s the last day of August. Some of us used to refer to it as the last day of summer but that was moved, it seems, to the middle of June. 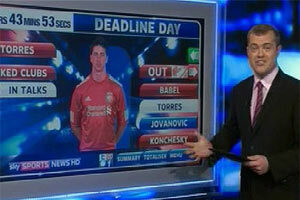 Nowadays it’s more commonly known as deadline day and for some it’s a day to get really excited. Why? In some cases maybe there’s a genuine feeling that their club’s fortunes will be dramatically enhanced by the time the window closes late that night. Even when it’s closed there’s a faint hope that details will come through of a deal that was done just in time but not announced until afterwards. It’s the hope that brings the excitement. For many fans the hope is for a miracle; in their heart of hearts they know their squad isn’t going to change but maybe, just maybe, a previously unknown clause will be taken advantage of and they’ll get that new defender their goalkeeper had been crying out for. They cling to that hope to block out the worry that their goalkeeper might actually just go and join that defender and the rest of his team-mates at their existing club. AN e-petition calling for “Full disclosure of all government documents relating to 1989 Hillsborough disaster” has received much publicity in recent days and at the time of writing had received over 77,000 signatures. If the petition reaches 100,000 signatures it becomes eligible for a debate in the House of Commons. The e-petition – epetitions.direct.gov.uk/petitions/2199 – was submitted after a decision by the Information Commissioner obliging the Cabinet Office to release the files. When the government announced, earlier this week, that they were going to appeal this decision the number of signatures on the petition grew from around 500 to the tens of thousands that it now contains. The Hillsborough Justice Campaign today released this statement on behalf of bereaved families and survivors to express their gratitude for the support that has been shown and to confirm their opposition to the government’s appeal and their own backing for the petition. We have been truly amazed at the level of commitment and support these past few days. It only reiterates what we have always known – the voices of people from all walks of life are just as loud as ever in their fight for justice and the truth. Liverpool supporters both home and abroad, supporters of other clubs and sports, professional footballers, managers and other high-profile names, all have been instrumental in getting the epetition on the brink of its required 100,000 signatories. To quote the professional footballer Joey Barton: “This is not about clubs, rivalries or cities. It’s about human beings and families losing loved ones”. The petition was initiated in response to the Government’s decision to appeal the release of Government information relating to the Hillsborough Disaster. We oppose the appeal and believe that the information should be released immediately in line with the Freedom Of Information Act. We see no reason why we should wait until 2012 to view information which relates to us and which has already been viewed by the panel set up by the government. Since we announced our backing of the petition on our Social Networking sites, we have received so many wonderful messages of support. We would like to take this opportunity to thank you all. Together we will reach this goal, and each and every one of you who contributed should be extremely proud of yourselves – we are all so proud of you. * After signing the petition online you will receive an email at the email address you provided. This email contains a link which you must click in order for your signature to be added to the total. Please check your spam or junk folder. If you haven’t received this email within a couple of hours you may need to sign again, using a different email address – a free GMail, Yahoo or Hotmail account can be used – again check your spam or junk folder. And thank you for your support. What are they hiding? Time for some truth. THE government is facing a backlash following its decision to appeal against an order to release documents from 22 years ago relating to the Hillsborough disaster. The documents reportedly include correspondence and reports sent to and from the Prime Minister of the time, Margarget Thatcher, in relation to the disaster that saw 96 people die. The order to release the documents came from the Information Commissioner, who looked at whether or not the Cabinet Office had dealt appropriately with a request for information made by the BBC under the terms of the Freedom of Information Act. The request was made in 2009, shortly after the 20th anniversary of the disaster. The Cabinet office was supposed to answer within 20 days. They took nine months – and refused to supply the information requested. The BBC, in response, requested an internal review. Internal reviews should “be carried out within 20 working days, but that this period may be extended to 40 working days in exceptional circumstances”. The Cabinet office didn’t take 20, or even 40 days. They took just short of seven months, and again refused to supply the information requested. The Information Commissioner then received a complaint from the BBC and in January 2011 asked the Cabinet Office to reply (within 20 working days) with further details of their reasons for refusing the request and also with copies of the information in question. 30 working days later and the Information Commissioner had not had a reply from the Cabinet Office, so they issued an ‘Information Notice’, giving the Cabinet Office another 30 working days to supply the information requested in January. It took them 54 working days to do finally do this. It had now taken just short of two years from the date of the original BBC request to the point where the Information Commissioner could look at the Cabinet Office’s reasons for refusing to supply the information. The Commissioner ruled that although it was correct to withhold one piece of information, due to it containing sensitive personal information of a member of the public (one of the survivors), that it should still be realised in a form that blanks out the name of the member of public. They Cabinet Office were given 35 calendar days to comply (by August 24th) and the report noted that the previous delays were “matters of concern”. The Commissioner pointed out that any appeal had to be made within 28 days – that day being August 17th, the day the appeal was announced. For once the Cabinet Office had met a deadline, but only just. In announcing the appeal a spokesman from the Cabinet Office said: “The Government’s view is that it is in the public interest for the process that is underway through the Hillsborough Independent Panel be allowed to take its course. The terms of reference for that process includes the intention to disclose information to the Hillsborough families first. “The Cabinet Office absolutely agrees with the principle of providing information to families about the Hillsborough stadium disaster, but we believe it is important that any release of information should be managed through the Panel’s processes and in line with their terms of reference. The Cabinet Office is fully committed to the disclosure process in line with the Terms of Reference and is working with the Panel to achieve that. The Hillsborough Justice Campaign will now have to seriously reconsider the relationship it has with the panel. Of paramount concern to the campaign is that the panel, via the government, should seek to police that truth in this way. The government (often referred to as “this Tory government”, despite officially being a coalition government) were criticised heavily by supporters of the campaign for justice. This goes beyond football; those who support the calls for justice aren’t all Liverpool fans or even football supporters. 96 people died, countless more were victims in other ways; real people want real justice for those real victims. Opposition MPs also joined the calls for the government to stop the cover-up and delaying tactics and release this information. Andy Burnham MP said, via Twitter, “This is a worrying move. It raises real questions about the Government’s commitment to disclosure and the work of the Hillsborough Independent Panel. “Families must have the full truth. Nothing less will do. I will write to Prime Minister urging him to intervene and drop this appeal. “The Government are saying the Panel will ‘have access’. That’s not the same as disclosure. Steve Rotheram MP, asked why he thought the government weren’t releasing the papers, suggested: “There has to be something that someone doesn’t want us to see!” He promised that he and other Merseyside MPs would be joining Andy Burnham in asking David Cameron, the current Prime Minister, to intervene. A petition had already been set up on the government’s “e-petitions” website calling for the information to be released. It had been signed by around 600 people early yesterday evening, by the time Kenny Dalglish and others had spread the word and asked people to sign it the numbers swelled rapidly. Kenny tweeted: “Please sign this petition and RT [retweet]. Think it is very important that we support this.” The link to the petition is http://epetitions.direct.gov.uk/petitions/2199 and at lunchtime on Thursday it had been signed by close to 23,000 people. As MPs try to get someone like David Cameron to do the right thing and intervene, the social networking tools that some want banned are helping to inform people around the country of exactly what they can do to help get the right thing done. The petition can only be signed by UK citizens or those who normally live in the UK, but everybody can spread the word about it being there. Those who can sign it can do so in about 30 seconds – but it’s important that they check their emails to confirm to the e-petition system that they are a real person and not a “spambot”. Names and addresses of those who sign it are not shown on the website. Cameron spoke last week, after the unrest around the country, about how “no phoney human rights concerns… will get in the way of bringing… justice.” He also spoke about “swift justice”. We’ve waited 22 years for justice for Hillsborough. We’ve waited over two years just for this one request for one file of information to be released, and we’re still waiting. We feel like we’re waiting for ever. And the reasons given for the delays all sound very phoney to us. It’s time to stop the phoney excuses and admit the wrongs that were done. Those helping continue the cover-up are as bad as those who started the cover-ups in the first place. Please sign the petition: http://epetitions.direct.gov.uk/petitions/2199. An advisory group has recommended to Liverpool City Council that they cut the allocation for Manchester United fans for the Premier League clash against Liverpool in October. The Ground Safety Advisory Group (GSAG) made the recommendations after studying the behaviour of Manchester United supporters at Anfield in April. 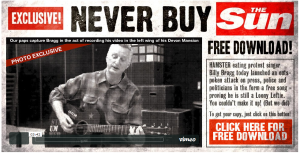 Billy Bragg has written, rehearsed, recorded and released a single in the space of a few days and it’s now available as a free download. The song is called “Never buy The Sun” and was written in the midst of the current scandal at tabloid and its sister tabloid, the now closed-down News of the World. In the song Bragg refers to the boycott of The Sun by Liverpool supporters and others in response to the lies it told in 1989 just days after the disaster that saw 96 Liverpool fans die. 22 years later The Sun boycott continues. Every day of the week. Liverpool supporters don’t buy The Sun and haven’t done so for 22 years. The decision in 1989 by the then-editor of the ‘paper’, Kelvin MacKenzie, to publish a catalogue of complete lies under a massive headline proclaiming it as “The Truth” saw a boycott begin that still holds strong to this day. As MacKenzie knew, it wasn’t the truth, it wasn’t even close, it was page after page of lies that were the product of clearly sick minds. Liverpool supporters had gone to watch a game of football. Ninety-six would never go home; many more would be injured. Survivors still struggle to deal with the sights they saw and the sounds they heard as they narrowly escaped death themselves. They were powerless as people, their own people, their own family or friends, died around them. The stories the survivors tell are chilling, harrowing to listen to; look them in the eyes and you almost feel that you are there with them, going through that hell. Except you aren’t; you couldn’t ever imagine that kind of hell unless you’d lived through it. Nobody would wish that kind of experience on you. No half-decent human being would play down what you’d gone through. And that’s where The Sun comes in. “The Truth”, had they made any kind of effort to find it, could have exposed not only the incompetence that allowed ninety-six innocent people to die but also the horrific experiences that this incompetence had put the survivors through. The Sun had no interest in “The Truth”. The Sun acted like it wanted to help a cover-up take effect. Continue reading 22 years later The Sun boycott continues. Every day of the week. Liverpool’s efforts to secure Aston Villa’s England international winger Stewart Downing are about to finally pay off after the two clubs agreed a fee for his transfer to Anfield. Downing, 27 later this month, will now undergo a medical for Liverpool as well as officially discussing personal terms. The fee is believed to be worth up to £20m. It’s important to note the words “up to” – that price is understood to include a number of add-on clauses containing conditions that need to be met for the fee to reach that value. The Reds are currently out in Asia after embarking on their pre-season tour of the region. They got off to a winning start in the first fixture, a 4-3 win over Guangdong Sunray Cave in China with Christian Poulsen, David Ngog, Andy Carroll and Conor Coady getting the goals. Coady was making his debut for the first team, as was new signing Charlie Adam who came on in the second half. UPDATE: Aston Villa have also confirmed an agreement has been reached with Liverpool for Downing. Their chief executive, Paul Faulkner, explained that Villa’s decision came after an improved bid from The Reds and also after Downing had put a transfer request in: “I can confirm that we have reached an agreement with Liverpool following an improved offer received earlier today and the submission of a formal transfer request by Stewart Downing, and have subsequently given them permission to speak with the player. Downing is believed to have made it clear he was interested only in a move to Anfield and the transfer request was an expected move should Villa continue to hold firm in their bid to keep him. Liverpool’s 18-year-old defender Andre Wisdom has been rewarded with a new contract for the club after progressing through the academy and reserve sides and into the first team squad. Centre-back Wisdom made it onto the bench for the last league game of the season at Villa Park and although that opportunity came in part because of injuries to other defenders there is no doubt at all that the club consider him a player with huge potential. Wisdom was one of a number of the club’s youngsters who got the chance to train with the first team following Kenny Dalglish’s return as team manager. Comolli, the club’s Director of Football, said Wisdom mustn’t take the new contract as an excuse to relax, there’s still much work for him to do: “We have shown for a while that if young players are good enough they will be rewarded. I told him when he signed it is just a step. It’s an achievement in a way, but he should not just sit on this contract and wait to see what happens; he should show that he is hungry and wants to keep progressing. Jay Spearing is a little older than the other players Comolli mentioned but his progress last season saw him used on a regular basis and rewarded with a new contract of his own. Spearing had previously signed a new deal in 2009 at the same time as another promising youngster, defender Stephen Darby, keeping the pair at the club until 2012. Unfortunately Darby’s career at Anfield now looks to be over after the club announced he would be going out on loan for the whole of next season. Darby, 22, has had loan spells at Swindon Town and Notts County in previous seasons and will spend next season on loan at League One Rochdale, after which he’ll no longer be under contract at Anfield. His chances of getting into the first team were further restricted by the assured performances of Martin Kelly and the rapid emergence of John Flanagan. Doncaster, MK Dons and Oldham were among the other clubs reported to be vying for his services and Rochdale are delighted with the deal. Announcing the loan on their website, the club said “Darby has tasted in action in the Champions League as well as the Premiership” and that his “services were in demand by a host of other clubs”. ‘Darbs’ will fly out to Spain on Friday morning to join his new teammates for pre-season training. 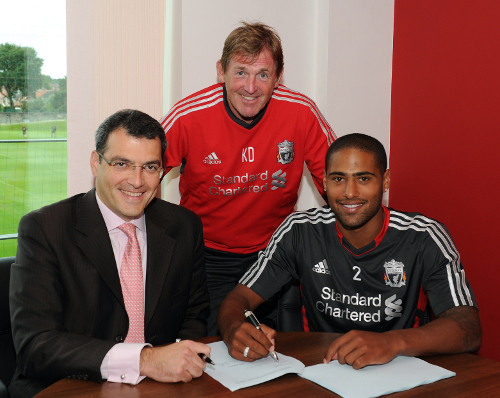 As Charlie Adam moved closer to becoming Liverpool’s latest new signing Reds full-back Glen Johnson became the latest player to sign an extension for the club. Johnson was signed from Portsmouth in the summer of 2009 in a £17.1m deal, a fee that was often cited by fans who were critical of the player, especially as Liverpool’s all round slump began to take hold. Johnson has been as good an example as any of the change in mood and performance levels after the return of Kenny Dalglish and has been in arguably his best form since signing the club.